Go Ape Treetop Adventure Birthday Parties at Stony Creek Metropark – Go Ape! The zipline and climbing adventure course at Stony Creek Metropark offers fun and exciting birthday party packages and party options! 2970 feet of ziplining and climbing adventures await! Go Ape Treetop Adventure Party Packages are available for kids ages 10+ and adults! Experience the ultimate playground, Go Ape Treetop Adventure. Located in the beautiful and scenic Stony Creek Metropark. With over 40 suspended obstacles, multiple zip lines and truly spectacular views, Go Ape delivers a bucket-list worthy adventure. Go Ape Treetop Adventure takes you on an engaging 2-3-hour exploration of the forest canopy. Perfect for groups of all sizes, make Go Ape your destination for a truly memorable birthday celebration. Gather a group of 10 or more to qualify for a party package and a 10% discount off the admission. 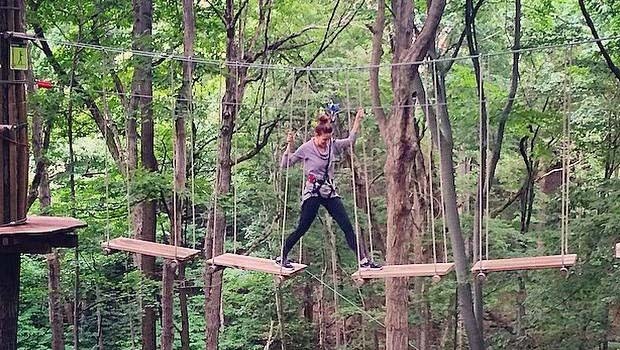 There are certain restrictions for the zipline and treetop adventure course at Stony Creek Metro Park. Guests must be at least 10 years old, 4 Feet 7 Inches tall, and can not weight more than 285 Pounds. Closed toe, closed heel, flat shoes are also required. Go Ape requires at least one parent or guardian to participate as supervisor for up to two 10-15-year olds. Participating adults may not supervise from the ground.